Susanne will appear on All Sides Weekend: Books with Christopher Purdy on WOSU radio. Character, dialogue, setting, point of view, plot, narrative are the building blocks to good fiction writing. This class will cover these elements and provide follow-up exercises. Prompts are an effective strategy to jumpstart both character development and plot. In-class writing exercises will illustrate how prompts can make a difference in fiction writing. Join Susanne as she reads from her two latest novels La Patrona & Her Mother’s Daughter. Bowen -Thompson Student Union, 806 Ridge St.
Susanne will be teaching a class on Writing Prompts on Saturday, November 4 at the 17 th annual Winter Wheat Festival of Writing that runs from November 2-4, produced by the Mid-American Review and hosted on the campus of Bowling Green State University in Bowling Green, Ohio. 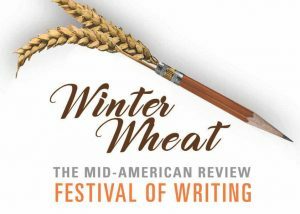 Winter Wheat is free, and celebrates writers and readers through workshops,‘keynote’ readings, special guest authors, book sales, and talks with Winter Wheat participants. This is the 12th annual Ohioana Book Festival, celebrating Ohio authors and book lovers from throughout the state. The event is free. Susanne will teach a workshop at the Write Stuff Writers’ Conference at the Upper Arlington Public Library January 12, 2019.